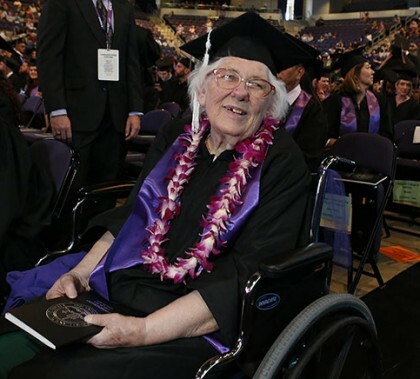 The commencement ceremony stopped for a few seconds Saturday afternoon so that 73-year-old Diana Dilcher could be properly acknowledged for getting her degree in communications. But if the crowd that was applauding knew the whole story, they would have given her a standing ovation. 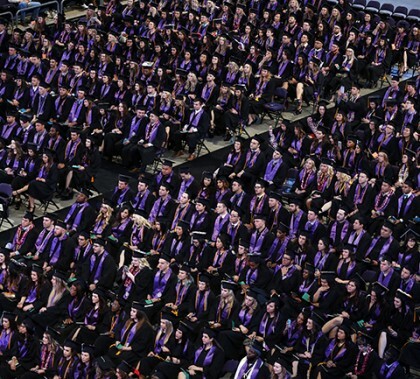 Photos by Darryl Webb GCU News Bureau Friday morning commencement at Grand Canyon University was for traditional students in the Colangelo College of Business, College of Education and College of Science, Engineering and Technology. 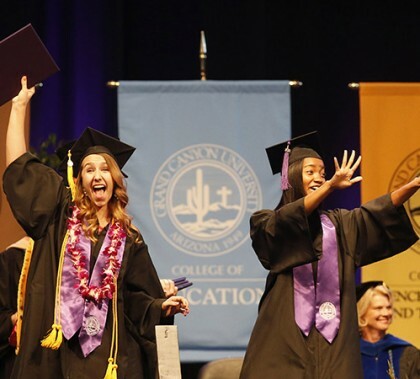 There were significant messages amid the tears of joy as spring commencement began Friday morning at Grand Canyon University. Speakers emphasized the importance of change, both in how you bring it about and how you deal with its inevitable challenges. “When we find our purpose, will we have the courage to pursue it?” student speaker Brittany Holen asked her fellow graduates. Ashley Baugus and Sallie Ausmus, two graduating students from the College of Education, designed and conducted The Gem Conference in Phoenix on April 16. The event, geared toward young adult women seeking community and an opportunity to grow in their faith, was a day of worship and powerful messages. One preschool director shares three personal pieces of advice for first-year teachers. A principal says that not all of the lessons are in the lesson plan. A teacher shares how networking helps educators go far. 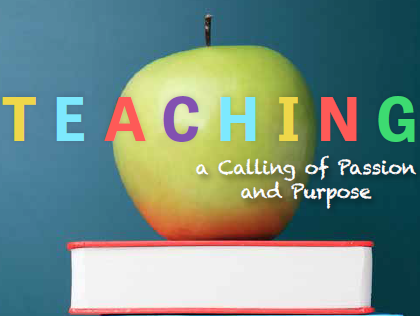 It’s all in the first book produced by the College of Education, “Teaching: A Calling of Passion and Purpose,” which is filled with inspirational stories for graduating students. Brenda Combs, online full-time faculty of the College of Education presented at the 2016 Computer Using Educators National Educational Conference in Palm Springs, Calif. Combs’ presentation, “Taking the ‘Dis’ out of Distance Learning,” focused on providing teachers tools for teaching within the online classroom. The second annual Senior Dinner Wednesday drew a crowd of 450 students, faculty and guests, formally dressed in dazzling gowns and sharp suits, to celebrate the hard work and contributions of the 2016 graduating class. The event recognized those outstanding students and staff who have shown commitment and excellence inside and outside of the classroom. 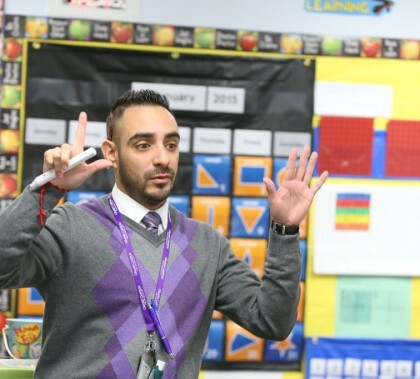 GCU College of Education graduate Anthony Perez, a RODEL scholar and second-grade teacher at Sunset Elementary School in Glendale, is one of 100 winners of the 2016 Winter Engineering Elementary Teacher Scholarship award. In addition to providing funds for him to attend a two-day professional development workshop at the Museum of Science in Boston, he will be able to implement the engineering curriculum with the storybooks, kits and materials that will be provided. 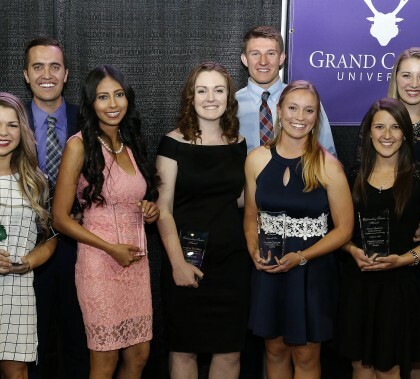 GCU has surpassed the 100,000 mark in alumni, and the accomplishments of that special group continue to resonate around the world. Here’s the story of what some of them have done and why people who hire them consistently put their resumes in the “yes” pile.